Chambered body, carved hardwood top, Wide Range neck humbucker - it shouldn't work, but it does. Upmarket looks and feel. Build quality. Launched in 2012, the Select series is the top tier of Fender's standard production ranges before you enter Custom Shop realms. 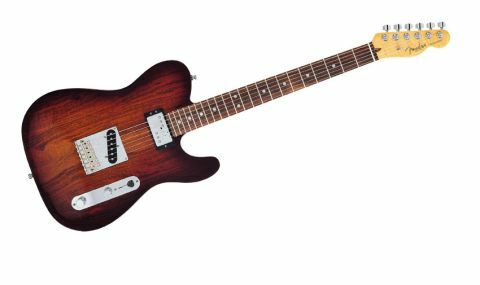 For 2013, a selection of new models were added: a carved top Jazzmaster, HH and Thinline Teles, and new versions of the Strat HSS and the Carved Blackwood Top Telecaster, reviewed here. "The neck has slightly rounded fingerboard edges that help create a played-in feel"
It's easy to dismiss the Selects as simply upmarket 'posh' Fenders. Yes, this Telecaster is spec'd with a carved 14mm Tasmanian blackwood top on a 39mm chambered alder back, but by design it aims to fit in style between the American Vintage and Deluxe ranges. A vintage/posh collision if you like, centring on top-quality woods but without the garish colours, multi-mollusc inlays or gold-plated hardware that are the typical adornments of high-end guitars. The Tele's 22-fret neck uses a standard unbound rosewood slab 'board on a very flame-y maple neck, and you can clearly see the fret slots on the fingerboard edges. The neck has slightly rounded fingerboard edges that help create a played-in feel. As with the 2012 Selects, we're hardly spoilt for colour options - there's only one. The thicker Tele body with its violin-like arching is chambered to reduce weight and impart a different resonance. This blackwood top has an interesting if not spectacular koa 'lite' type grain. The finish is quoted as being a lacquer (aka nitrocellulose) topcoat: it's a little mottled, noticeably on the carved face. Hardware remains the same on these 2013 Selects with the American Standard Tele bridge, as used on non-vintage higher-end Fenders. There are vintage-style bent-steel saddles and, as on the 2012 Tele, the height-adjustment screws protrude sharply. Again, we get the rear-locking dual-height tuners, the bottom three strings have standard height posts, and those for the top three have shorter posts, increasing the strings' back angle behind the nut. The Tele's bridge pickup seems fairly vanilla - there's plenty of honk and high end, but it's somehow more controlled than our reference '69. It's a little more open in the midrange, and some of that would seem to come from the more Strat-like saddles. The typically wider mix pickup tone can be thicker or thinner depending on whether you select the full or single-coil mode of the Wide Range 'bucker, while the full-coiled neck pickup on its own is an excellent addition. Clean, it doesn't sound overly muddy, and with a little tone and volume reduction you have a good softer jazz voice. Conversely, with some gain and volume there's more clarity, power and bite compared to the Tele's usually rather muted output. But if you like that sound, as many of us do, the single-coil voice sound gets much closer. Exactly what the chambered alder back and blackwood top construction bring is harder to pinpoint. At stage volumes, though, there's a very attractive and subtly woodier resonance, and the full-coiled neck pickup takes a slight move into more ES-335-like territory. Aside from a couple of issues - it would benefit from a tougher setup with increased neck pitch, and it has a less-than-flat finish - this is a highly enjoyable guitar that broadens the original's visual and tonal reference points without going too upmarket in looks. The Tele suits this treatment, and with attractive sub-£2k street price, despite the competition from numerous boutique brands, this is far from shabby.